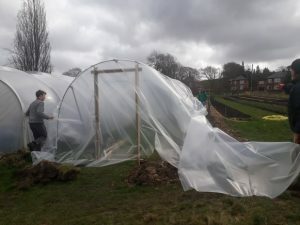 Welcome to the site, big poly tunnel’s wee sister, the soon to be Chilli house! 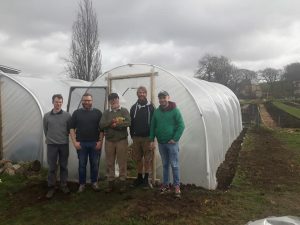 I’m beyond amazed at the speed in which this team of volunteers put up our new poly tunnel. Chris, looking like he was off to the office, casually prevented us from making some morbid mistakes and kept us literally on the straight and narrow. 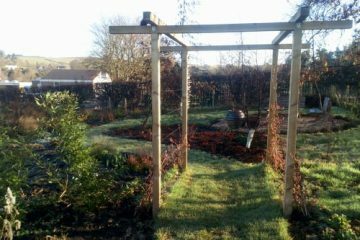 Ed and David made me laugh so much I kept uselessly holding the wrong things in the wrong places, so in the end I stuck to shovelling dirt. But thanks to everyone’s skill and hard work, it now looks totally amazing. 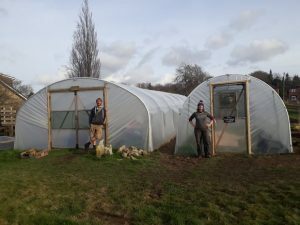 This poly tunnel frame was kindly donated to us and we’re very grateful. 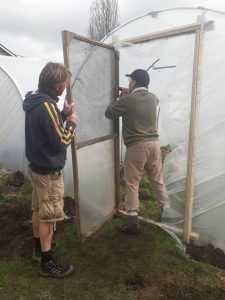 It is where we’ll be growing our tomatoes, chillis and capsicums (with a bit of luck) and I’m still hoping Sam will let me have an armchair in there…..
Why don’t you come along and help us plant up some seeds? If you’d like to help drop us a line.